Inspired by the Italian Renaissance and the golden age of art and culture this is a fruity floral fr.. Introduced in 2014, Asian Green Tea women's fragrance is a light, earthy scent for women who revel i..
Classic and contemporary style blend beautifully in Cedre Blanc, a women's fragrance from the design..
Fantasia De Fleurs by Creed is a timeless classic scent with rose, iris and ambergris. Alluring and .. If you're the type to stop and smell the flowers, then Fleurs de Gardenia is a women's perfume after..
Creed Green Irish Tweed was originally created for actor Cary Grant. The spicy, sporty blend contain..
Iris Tubereuse is a youthful, whimsical scent that appeals to discerning women who appreciate the fi..
Love in White by Creed was introduced in 2005, and the first bottle was given to Laura Bush. A flora.. This fantastic fragrance was created by Creed, in 2005. Its marvelous scent includes a mixture of ci.. 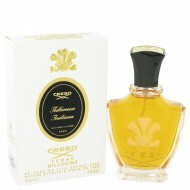 Original Vetiver by Creed was introduced in 2004 as a sophisticated scent for men. This masculine sc.. The heady yet soothing scent of tuberose is an old staple in Ayurvedic medicine, renowned for its ab..